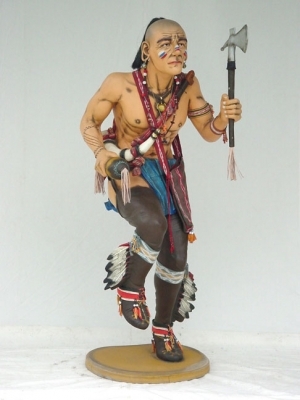 This impressive Native American figure is full of detail in his costume and accessories. He looks fabulous in a Red Indian village set or with our other Cowboy and Indian figures and props. 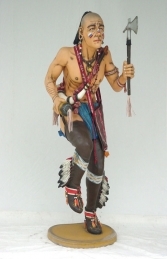 This 3d Indian Rain-dance Native American model is made of cold-cast poly-resin and fibre-glass, he has a great deal of decoration with a cloth bag and replica tomohawk and ceremonial rattle. He is an ideal and interesting model for theming a Wild West area, for advertising or drawing attention to your business, or even as a great gift! PLEASE CONTACT US ON 01626 833646 or 07860 680181 TO DISCUSS THIS RED INDIAN MODEL & THE OTHER WILD-WEST FIGURES IN OUR WESTERN THEME SERIES. PLEASE PHONE US TO PLACE AN ORDER & FOR A QUOTE FOR DELIVERY COST TO YOUR POSTCODE.